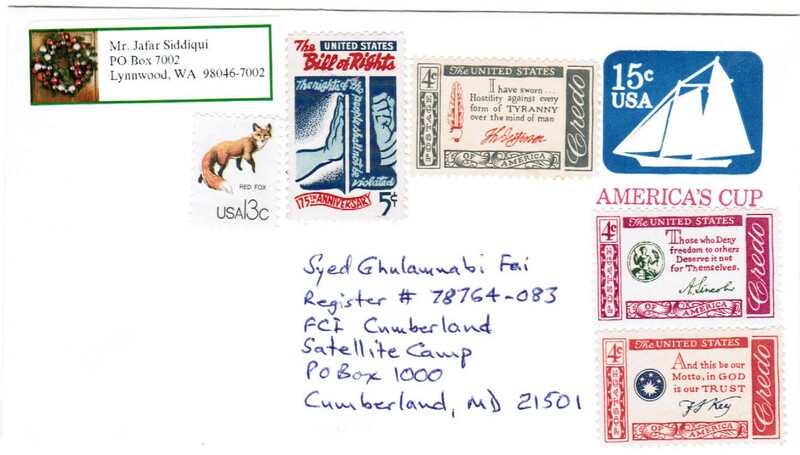 I received the letter from Dr. Fai in which he also gives his mailing address and I sent him a brief letter of support in the mail, see below and note the stamps I used, one says, “I have sworn Hostility against every form of TYRANNY over the mind of man“. What should we do as good Muslims? as good Humans? as good Americans? Should we suppress our consciences and walk through life with moral blinders or, should we take a stand against matters that go against every standard of morality and justice there is? If we remain silent, all we are doing is encouraging the forces of evil and allowing for oppression to prevail in the lands where we live (in my case, the US). If we speak out, to be sure there is an element of fear and perhaps, consequences, but if we speak out, we provide encouragement to the oppressed and encouragement to those who sit on the fence-line, unable to decide and to those who wish they could also speak out, but do not wish to be the first. Ramadan is starting on the 20th of this month. For Muslims, Ramadan does not mean simply going hungry and thirsty all day, it means getting closer to God by standing up for Truth, Justice and supporting the underprivileged and the deprived. Otherwise, fasting is merely another diet plan. Words cannot express the feelings of the absence of my friends and family who have given me their love and sympathy during the past so many years. They have kept me in their prayers during these tough times. I am hopeful that their warmth and generosity will continue in days to come. I am extremely delighted to know that the Kashmiri American Council (KAC) has chalked out a tangible plan of action for 2012 to promote the Kashmir cause. The details of their future activities will be communicated to you by the Board in due time. You are all in my heart and soul. I hope to communicate with you as circumstances permit. Some of you have expressed the desire to know the procedures and permissible times for visitation. Visitations by family and friends are encouraged. However, the list of visitors has to be approved by the Counselor. In order to know more details about the process of visitations, please call 571-277-0428. Cumberland, MD – 21501, USA. I am praying for the release of POW Bowe Bergdahl. I am of a willingness to negotiate for his safe passage. Dr. Siddique like yourself is incarcerated in Texas. I care not for political ramifications. I myself am from the Black Palace. I know negotiations and the time in hell one must spend. I have the Power of Rome shadowing my every breath. All that I pray is for one young boy . He wants to come home. As do we all.